Wiping Israel off the map, forcing Israeli Prime Minister Benjamin Netanyahu to flee via the sea, threatening Europe with missile capabilities if efforts are made to disarm the Iranian missile program—these are just some of the sentiments expressed in the last year by the new leader of the Iranian Revolutionary Guard Corps (IRGC), Maj. Gen. Hossein Salami. And all of these sentiments were reported by Iranian media. The IRGC is a powerful military body in Iran that also wields significant economic influence. The IRGC was recently designated by the United States as a terrorist organization due to their involvement in terrorism around the world. It’s official. Barring an unexpected breakdown in political negotiations to form a new governing coalition, Benjamin Netanyahu will once again be prime minister of Israel. 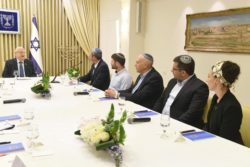 Tuesday was day two of the Israeli political parties informing President Reuven Rivlin of their recommendations for the next prime minister of Israel, and a majority of legislators in the Israeli Knesset (parliament) nominated Netanyahu. Appropriately, it was the politically right-leaning United Right party whose support pushed Netanyahu past the 60 legislator threshold to form a majority ruling group in the 120-member Knesset. Rivlin, in comments published in an Israeli press release, highlighted this honor when United Right recommended Netanyahu. The Israeli military won a victory on Friday, not on the battlefield but in the courtroom. The International Criminal Court (ICC) at the Hague rejected the request of the prosecutor to bring war crimes charges against US forces involved in the Afghanistan conflict. 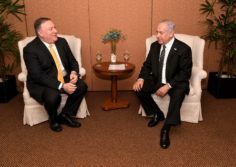 The decision, according to Israeli Prime Minister Benjamin Netanyahu, is far-reaching and sets a precedent for dealing with soldiers from Israel—who like the US has a robust judicial system and is not party to the ICC treaty. 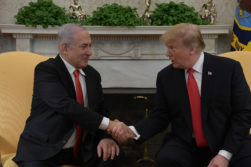 However, while Israel and the US responded to the decision as though it is broad in scope, the ICC decision itself did not appear to exclude the US or other parties from war crimes cases in the future and dismissed this prosecution mostly due to circumstantial reasons, according to the ICC website. For the first time in American history, the United States is designating part of a foreign government a foreign terrorist organization, as the Islamic Revolutionary Guard Corps of Iran will carry that label effective April 15. 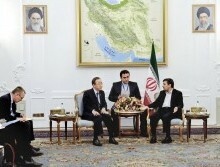 US Secretary of State Mike Pompeo noted that the unique move to so classify the IRGC—which is part of the Iranian military and has deep ties inside the Iranian economy—is well deserved given the unique range of aggression carried out by the group. 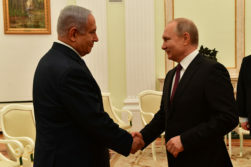 PM Netanyahu and Russian Pres. Vladimir Putin. The involvement of the Russians in assisting Israel in recovering the remains of a soldier lost in action for 37 years was unveiled on Thursday, including help from President Vladimir Putin himself. 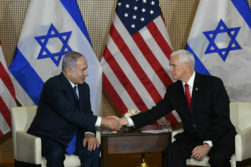 “Two years ago I turned to you with a personal request—that you help us in finding the remains of the soldiers, including Zachary Baumel, out of the great shared values of comrades-in-arms and fellowship of soldiers,” Israeli Prime Minister Benjamin Netanyahu told Putin during a visit to Moscow. Baumel was lost during the First Lebanon War in 1982. Baumel went missing in a battle with the Syrians in Lebanon, two of Israel’s most hardened enemies. However, in recent years the Syrian civil war has opened that country to a wide range of other nations battling terrorism or taking sides in the Syrian conflict, including the Russians.